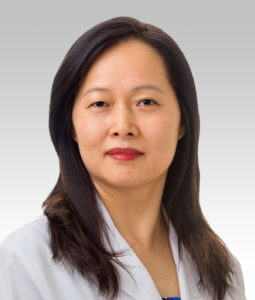 Jindan Yu, MD, PhD, professor of Medicine in the Division of Hematology and Oncology and of Biochemistry and Molecular Genetics, and co-leader of the Translational Bridge Program at the Robert H. Lurie Comprehensive Cancer Center of Northwestern University, was the principal investigator of the study. A Northwestern Medicine study has provided new insights into a signaling pathway underlying metastatic prostate cancer and suggests that combining a drug called galunisertib with established therapy may improve treatment response and slow cancer growth. The study, published in the Journal of Clinical Investigation, was led by Jindan Yu, MD, PhD, professor of Medicine in the Division of Hematology and Oncology and of Biochemistry and Molecular Genetics. Prostate cancer is the third-leading cause of cancer-related death among men in the U.S. Although localized prostate cancer is often successfully treated, there is no cure for metastatic prostate cancer, which remains a fatal disease. Typically, advanced prostate cancers are first treated with hormone therapy, but most eventually become resistant to the treatment — a stage referred to as metastatic castration-resistant prostate cancer. The arrival of next-generation drugs such as enzalutamide have helped prolong patient survival, but most cancers soon develop resistance to these therapies, as well. “There are about 30,000 deaths from prostate cancer every year, with a vast majority of lethality caused by metastatic castration-resistant prostate cancer. There is an urgent clinical need to prevent or overcome enzalutamide resistance,” explained Yu, also co-leader of the Translational Bridge Program at the Robert H. Lurie Comprehensive Cancer Center of Northwestern University. Recent research has shown that castration-resistant prostate cancers develop resistance to enzalutamide through a mechanism known as lineage plasticity. Lineage plasticity allows prostate cancer cells to shift their phenotype from luminal epithelial cells to basal-like cells, which no longer depend on the target of hormone therapy, and therefore evade those treatments. In the current study, the Yu Laboratory demonstrated that a transcription factor called FOXA1 is an important regulator of lineage plasticity. They also showed that loss of the FOXA1 gene — one of the most frequently mutated genes in prostate cancers — significantly increased TGF-beta signaling, a pathway linked to cancer metastasis. The study’s findings confirm what has been a strong interest in the field to therapeutically target the TGF-beta pathway in advanced cancer. Furthermore, the scientists demonstrated that a drug in clinical development called galunisertib — an inhibitor of the TGF-beta pathway — sensitized prostate cancer cells to enzalutamide. When used together, the two drugs synergistically inhibited cancer growth both in vitro and in a mouse model of castration-resistant prostate cancer. “Our study suggests combinatorial use of enzalutamide and galunisertib in metastatic castration-resistant prostate cancer,” Yu said. Northwestern is now participating in a multi-institutional clinical trial to evaluate the benefit of the drug combination in castration-resistant prostate cancer, compared to enzalutamide alone. Maha Hussain, MD, the Genevieve Teuton Professor of Medicine in the Division of Hematology and Oncology and deputy director of the Lurie Cancer Center, and Alicia Morgans, MD, MPH, associate professor of Medicine in the Division of Hematology and Oncology, are leading the clinical trial at Northwestern. Clinical samples will also be collected to determine whether FOXA1 and TGF-beta levels help predict patients’ response to the combinatorial treatment, Yu noted. Bing Song, PhD, a postdoctoral fellow in Yu’s laboratory, was the first author of the study. The study was supported in part by Northwestern’s National Cancer Institute-funded Prostate Cancer SPORE P50CA180995, National Institutes of Health grant R01CA172384 and R50CA211271, and Prostate Cancer Foundation grant 2017CHAL2008.